A couple of years ago I saw a thread on a message board about slow cookers. 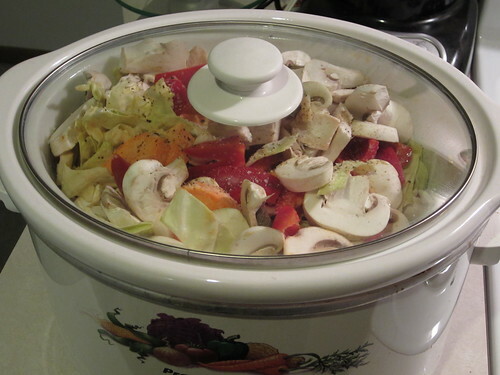 A number of women didn’t feel comfortable with leaving a slow cooker on all day unless they were at home. They felt a heated appliance that was turned on all day was a fire hazard. I have to admit, that really never occurred to me. The reason I even have a slow cooker is to have dinner cooked for me while I’m gone for the day. Isn’t that the whole point? For as long as I’ve known him, B has never left his dryer running if he leaves the house. (I’ve picked up that habit, as well – never know when a dryer fire might start.) The above mentioned message board thread also mentioned people who wouldn’t leave their dishwasher running unattended – that one has not infuenced me – at least, not yet. However, a couple of years ago, my neighbor had an issue with her washing machine – the water wouldn’t shut off. It was a late summer night, and she came over in a panic because the water just kept flowing. and the machine overflowed. Together, we tried to get it shut off, to no avail. As a result, I pay attention to make sure my washing machine and don’t leave it unattended. But, at least there’s a drain to help ensure the place doesn’t flood. I am much more careful these days when it comes to appliances running when I’m not around. However, I still use my slow cooker, even if I plan on being out of the house for a good portion of the day. I do make sure there’s nothing placed close enough to pose a fire hazard, however. 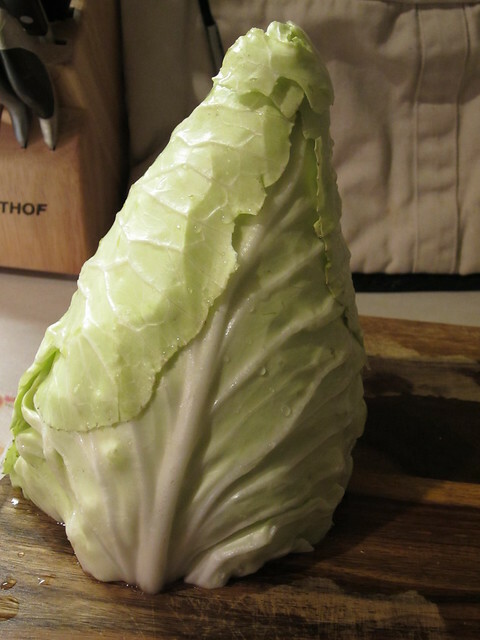 So when a recent produce box contained a head of cabbage, I started thinking about what to do with it. 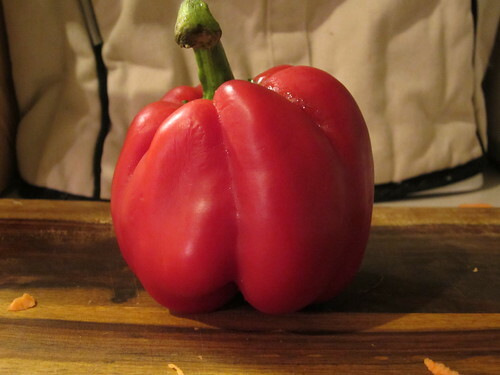 I’m not a big slaw fan, and neither is B (whom I split the produce with). I had, however, recently seen a slow cooker curry recipe that suggested cabbage as one of the veggies. I may not be a fan of cabbage, but I adore curry. A slow cooker full of food will yield some nice leftovers, as well. The curry paste I use (from Thai Kitchen) is gluten free. 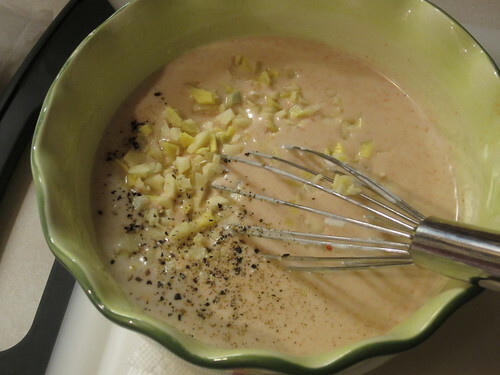 Whisk coconut milk, curry paste, honey, fish sauce, and a generous sprinkle of black pepper in a small bowl. 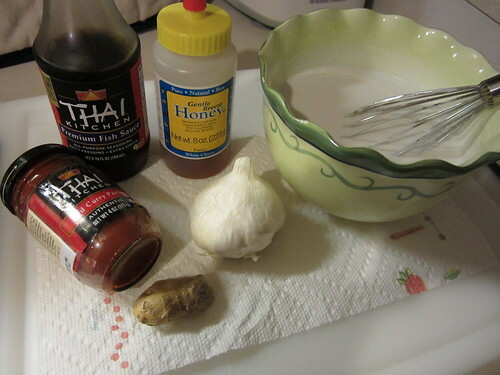 Add garlic and ginger, whisk again to combine. If using chicken, sprinkle with salt and pepper. 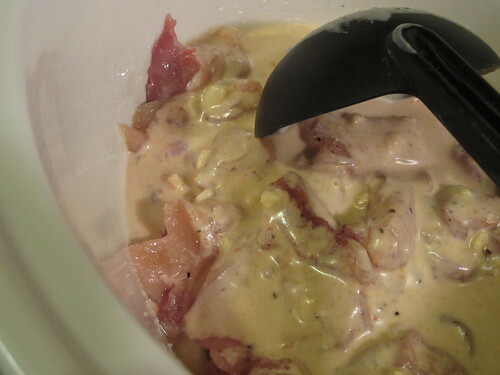 Place chicken or garbanzo beans in bottom of slow cooker insert. Cover with half the coconut milk mixture. 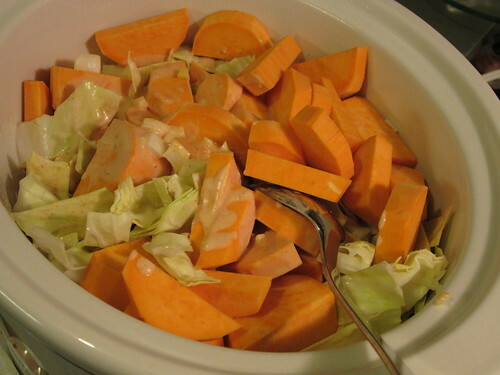 Add cabbage and sweet potatoes to the insert. Pour remaining coconut milk over, stir slowly to combine. 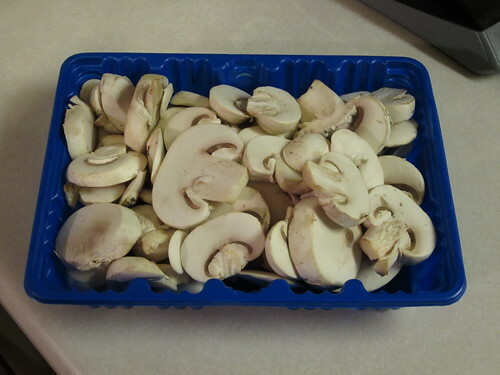 Add peppers and mushrooms, cover, and cook 7-8 hours on low. If using basil or cilantro, add after 7-8 hours, mix, and cook for 1 more hour. This looks great! 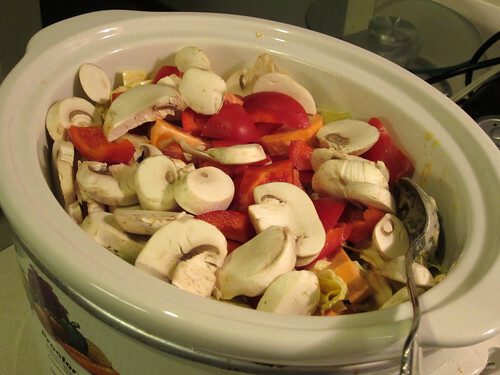 – don’t you just love the slow cooker?! And I am so loving anything with Curry right now! Thanks for sharing! I am 63 years old and have been using a crock pot since I started cooking at the age of 12. I believe it is safe to use and have never baby sat it. I always unplug the toaster when it is not in use. The reason I do this is because of studies I’ve read about or watched on television which documented the capability of toasters to catch fire.